U2 live on YouTube - Sun Oct 25th! The U2 'No Line On The Horizon Tour' is coming to YouTube! 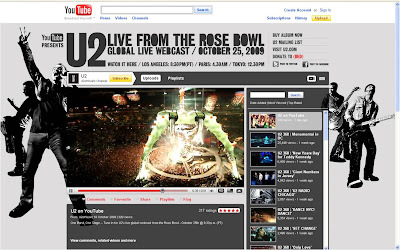 On Sunday 25th October 2009, U2 will be streaming live from the Rose Bowl onto YouTube. The U2 YouTube webcast starts at 2030 (PT) through the U2 YouTube channel at youtube.com/u2. The full show will also be recorded and available for viewing on YouTube the following day, whilst a Twitter gadget embedded on the U2 YouTube channel will socialise the event. The U2 YouTube webcast is another example of how events can be socialised and taken to a global audience - and as YouTube becomes more of a distributor of professional content then this sort of thing is likely to become more common. This is not the first time that bands have streamed concerts live on the internet, but "U2 live on YouTube" could well end up being one of the most significant webcasts to date. Here is the full live U2 YouTube concert live from the Rose Bowl in California. I don't know how long it will stay on YouTube so enjoy while you can!